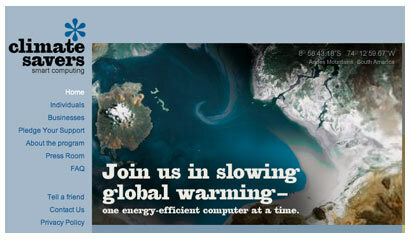 The Climate Savers Computing Initiative aims to reduce power consumption by computers by 50% by 2010. With a swish design and press releases from several big companies the group should go far. The goal of the new broad-based environmental effort is to save energy and reduce greenhouse gas emissions by setting aggressive new targets for energy-efficient computers and components, and promoting the adoption of energy-efficient computers and power management tools worldwide. I particularly like how easy they’ve made it for both individuals and companies to get involved. Individual consumers can also support the Climate Savers Computing Initiative by signing up at http://www.climatesaverscomputing.org, where they will be able to pledge to purchase an initiative-certified system. The Web site will also help consumers learn how to take advantage of their existing computer’s power-saving capabilities such as sleep and hibernate modes, which can reduce the amount of energy consumed by up to 60 percent. The Climate Savers Computing Initiative is a licenced offshoot of the World Wildlife Fund’s Climate Saver programme that involves several leading companies working to reduce their carbon footprint. Having achieved a 20% avoidance of global carbon dioxide emissions through energy conservation from 1990 to 1997, IBM further avoided the greenhouse gas emissions associated with the company’s annual energy use by the equivalent of an average of 5.7% from 1998 to 2004, exceeding its Climate Savers goal. This is the first time our Climate Savers program has been applied to an entire sector, engaging manufacturers, retailers and consumers…We are pleased to join these industry leaders to provide solutions to address climate change. My only niggle is the missed opportunity. Sustainability is about complex systems. WWF has a much wider environmental brief, One Laptop Per Child has a social/education take on sustainability. So I’m surprised, and a little worried to see such a good campaign focused on a single issue.